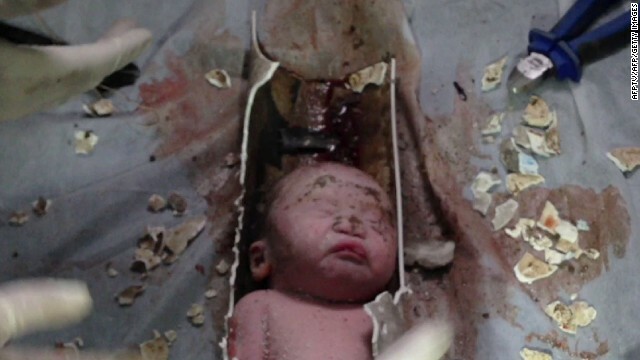 The tiny face of a newborn baby boy is revealed as rescuers cut apart a sewage pipe at a hospital in Jinhua, China, on Saturday. A newborn baby boy who was found alive inside a toilet pipe in Jinhua, China, has been released from a hospital and taken home by his maternal grandparents, police said. The child's mother is still being treated at the hospital, but has been cooperating with the investigation, Xiang Jiangsong, a police official, said Thursday. The police are labeling the case an "accident" at this time, and no charges have been filed against the mother. While all human life is precious, millions of children born in this world are unwanted and many are put to death. To single out this one "fortunate son" serves no newsworthy purpose. That is not a baby. The government has no business getting between a woman and her right to choose. Reproductive rights! Do not infringe on a woman's CIVIL RIGHTS to abort her unwanted fetus. And make taxpayers fund it. Why do I deserve the death sentence ?